Boost morale and retention, reduce stress, increase performance and creative flow. Showga package includes full setup and breakdown, sound equipment, yoga mats, certified instructor and musician. Participants learn to work with the 5 senses as tools for wellness and increased performance. Session themes include stress reduction, creative flow, and confidence building, etc. Choose a theme, create your own, or participate in a series! Retreats, team-building activities, corporate events, parties, trade shows and more. Build employee engagement, boost morale, and promote a dynamic company culture. 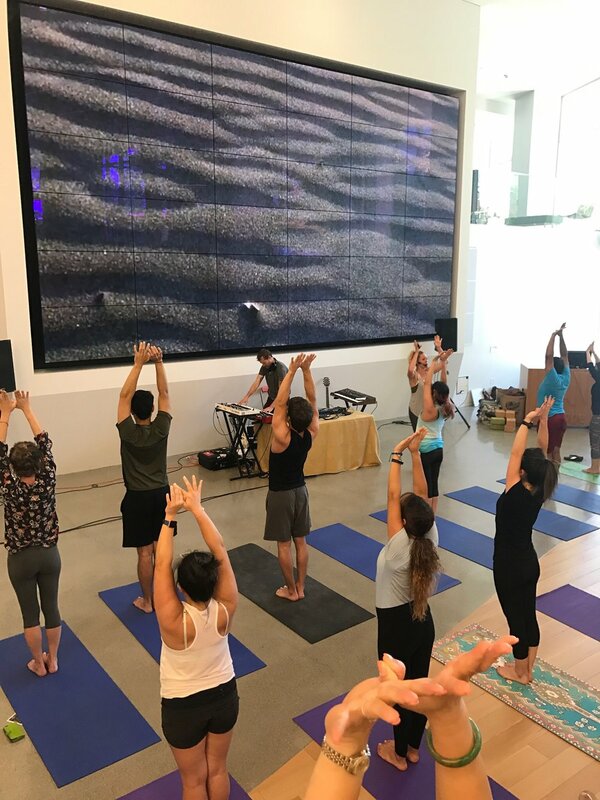 Showga is a unique addition to your company’s wellness offerings. Book a series of sessions and send your team on a journey through them all! Boost employee morale and retention, reduce stress, increase performance and creative flow with Showga in the workplace! Book a one-off session, or take advantage of our monthly or quarterly subscription rates, sending your team on a journal through all of the themes! Thank you for your interest in the Showga Subscription Program! We will reach out within 24 hrs to discuss the details. Showga will arrive an hour before a session for load in, setup, and soundcheck. Host your event in a conference room, auditorium, lobby, or outdoors. If your office has limited space, Showga will book a venue in your neighborhood! Showga works with some of the most innovative, desirable companies in the Bay Area.